Bromeliads originate from South and Central America, the Caribbean and West Africa. They grow in deserts, mountains and forests. The most well known bromeliad is the pineapples, but this is just one of over 3000 different species. 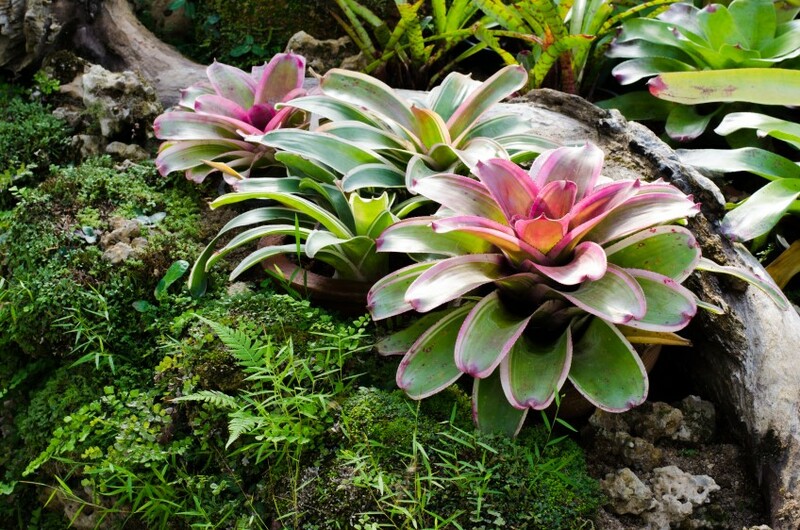 Many bromeliads have a central funnel of leaves for collecting and storing water. These water pools are used by some species of poison dart frog to rear their tadpoles in. The tadpoles feed on the algae and insect larvae inside. Pineapples rely on hummingbirds for pollination in the wild. Pollination leads to the formation of seeds. In Hawaii importing hummingbirds is banned to prevent pineapple fruit growing with seeds. The main threats to bromeliads are habitat loss and invasive pests. In Florida the accidental introduction of the Mexican weevil threatens several species.